The Southern Vegetarian Chronicles: HOT! A Lesson on Life from Cooking with my Little Girl. HOT! A Lesson on Life from Cooking with my Little Girl. The other day my youngest daughter pulled up a chair to help me cook beans and rice. I have to let her chop the onions and garlic with a butter knife and help me pick herbs from the garden. We have fun! All in all I am pleased that she wants to cook. She even recently made a raw kale and strawberry salad for her brother which is to your right. Unfortunately, even with me moving pots, and the child, and explaining that the stove is hot, my little one felt the unwavering need to touch the hot pot of beans. In the few seconds it took me to turn and rinse my pepper, I hear the word "Hot" from my daughter as she grabs her fingers. I know, I’ve heard the story of no matter how many times you tell a child not to touch the hot stove it won't register until they actually experience the heat. Well, to my dismay, my warrior princess wanted the experience. (My son on the other hand at that age, took my word for it.) The thing I love about my daughter thought is that she didn't let the sting keep her from continuing her cooking quest. She pulled at the onion with her butter knife until she had a piece to place on the rice. She also seasoned the beans with salt and spices. We did have to wrap her finger with a burn gel to make the initial sting go away but she kept on and didn't let the mishap scare her. Kitchen wisdom can be such a great teacher. How many times have things in life burned us and instead of putting on a little burn gel and staying determined we let it scare us and we quit. Well like I say, just keep cooking and something good will happen! Now, when my little one helps me cook she points to the pots, will say "HOT", and not touch anything. I guess this goes back to the philosophy that children learn best through personal experience. On that note, below is the method for how I prepare my beans. Take care and Enjoy! 1. I soak my beans for at least 4 hours. 2. I place them in a pressure cooker for a faster cooking time. 5. 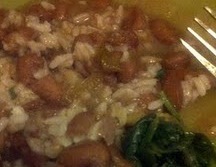 I boil my beans in the pressure cooker in a 2 1/2 cup of water to 1 cup of bean ratio with the lid off until a foam rises. I take off the foam reduce the water until it is about and inch or so over the beans then put the pressure cooker lid on and wait until it hisses. 6. Once it starts hissing I cut down the heat and use a "flame tamer" (you can get one at Bed, Bath, and Beyond) to help disburse the heat evenly while cooking. I let my beans cook for about 45 minutes. 7. While my beans are cooking I saute' my onion, garlic, bell pepper, and set them aside. 8. Once my beans are finished I add my onion mixture, vegetable bouillon cube, salt and any other spices, and let them cook together for another ten to fifteen minutes. 9. Add rice and dig in! Thanks Paula, she is fine.